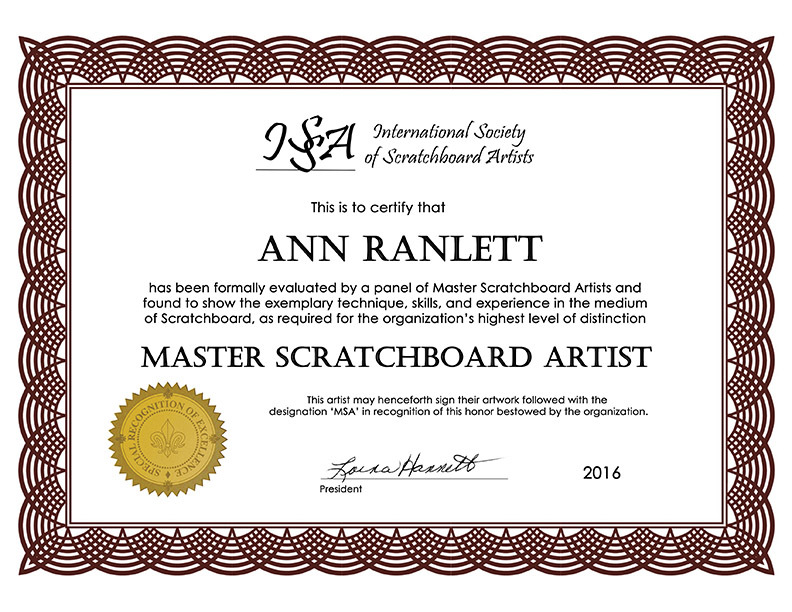 Ann Ranlett, MSA, is an artist and illustrator specializing in pet/animal portraits and nature subjects rendered scratchboard, watercolor, pencil and mixed media. She graduated from CSU, Sacramento, with a bachelor’s degree in biology. Ann is a member of the Auburn Old Town Gallery, a collaborative gallery where her original drawings & paintings, reproduction prints and note cards are available. She accepts commissions for pet and animal portraits and enjoys working with devoted owners and their beloved animals. 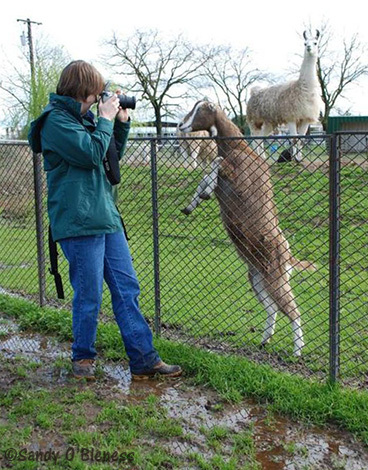 Ann is also a photographer – looking for unique perspectives of the natural world. 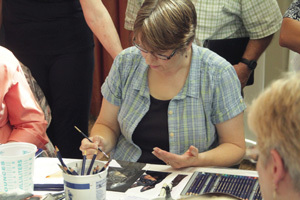 At Open Studio and other art-related events, Ann offers demonstrations of her creative techniques and discusses her artwork. Ann’s art has won awards at the national and international level (see her resumé for a complete list). She also teaches workshops. 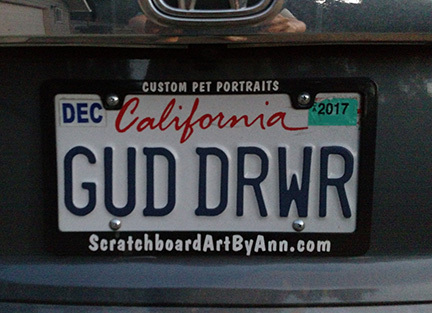 Prior to making the leap to full-time artist in 2003, Ann was senior technical specialist at Foothill Associates, a consulting firm in Rocklin, CA. Her responsibilities at Foothill Associates included producing computer generated maps & graphics, designing & maintaining web sites and creating illustrations for educational signage. Her interpretive signage designs and illustrations can be seen along the trails at Lake Natoma and at Mather Regional Park in Sacramento, CA. She also provided the illustrations for three interpretive signs to be installed at the Curtz Lake study area in Alpine County, CA. In 2015, she provided illustrations for three interpretive signs that were installed along a along a creek corridor by the City of Roseville (CA). decals for these cars. Visit Ann’s Facebook album and this web page to find out more. Ann has also contributed a variety of illustrations to the Sacramento Zoo, Roseville Dog Owner’s Group, Chako Pit Bull Rescue, Foothill Associates, Sacramento Splash (a wetland education organization), Loomis Basin Horseman’s Association, the Folsom Zoo, the Nature Conservancy’s Cosumnes River Preserve and the Sacramento Chapter of Ducks Unlimited. She also painted two “cat suites” in FieldHaven Feline Center’s shelter and designed the logo. Ann, her husband and a Chihuahua mix, live near Auburn (in Placer County, CA), where they’ve landscaped areas of their property with an emphasis on native plants and wildlife habitat. “My lifelong interests in nature and drawing and my biological/scientific background make me well-suited and comfortable with realistically rendered pieces. I’m fascinated by the textures and colors found in nature. I’m really in my element when working with scratchboard; it’s surprisingly forgiving and I love the textures and detail that can be rendered on the surface. I also like working in graphite pencil for similar reasons. – Boston Terrier drawing licensed to Suzuki Motors. Read the press release and the article in the Sacramento Bee. – An interview and a blog post on Artist Career Training about “Appeals for Art“, Ann’s collaborative project. Listen to the audio interview.